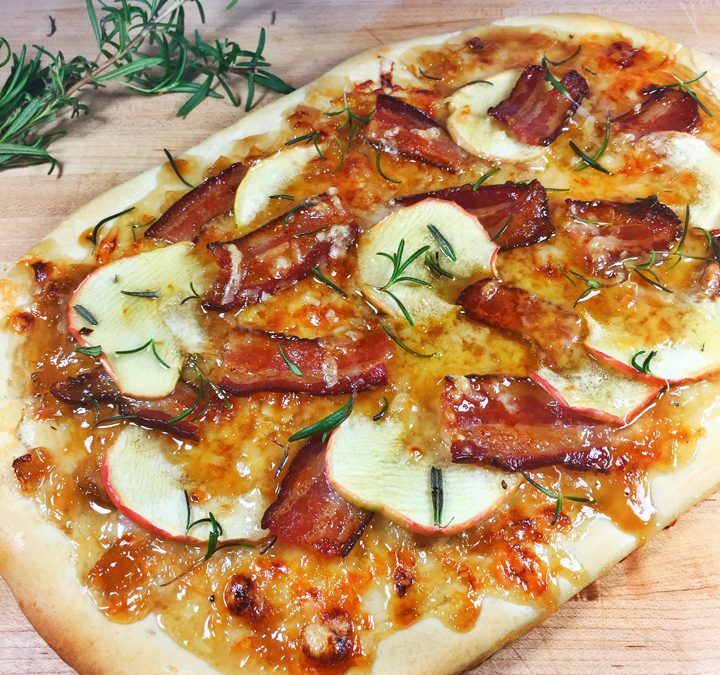 Savory applewood smoked bacon combined with sweet onion jam, apples, and maple syrup makes this appetizer flatbread the hit of any holiday party or get-together. Using only seven ingredients purchased in most grocery or specialty stores, you can pull together a quick appetizer that makes you look like a culinary genius. Using a high-quality onion jam in this recipe is what makes this dish delicious. If you don’t have time to prepare your own, Stonewall Kitchen makes a delightful Roasted Garlic Onion Jam perfect substitution. Frozen pizza dough is available at specialty grocery stores; merely thaw overnight in your refrigerator before preparation. Roll the dough out into a thin oblong shape, 9 x 13, and place on a parchment lined sheet pan. Spread the onion jam evenly on the dough leaving a 1” border. Sprinkle ⅔ of the cheese over the dough, and cover it with the bacon and apples. Lightly brush one tablespoon of the maple syrup over the apple slices only. Sprinkle the remaining cheese over the flatbread. Bake for 15 minutes, or until the crust is golden and the cheese is bubbly. Remove and drizzle the remaining maple syrup over the flatbread, then sprinkle evenly with fresh rosemary. Cut into sixteen squares and serve. Makes 16 appetizers size servings.